[August 14, 1918] My Dearest Bess: Well having put in one complete day here I will try and describe my sensations. We arose at 6:30 by bugle call dressed and appeared on the grounds at 7. Had setting up exercises for 15 minutes and then 15 minutes lecture on aquitation if you know what that means. Then went over and had a physical examination for oversea service and was pronounced first class. Then reported to the C.O. 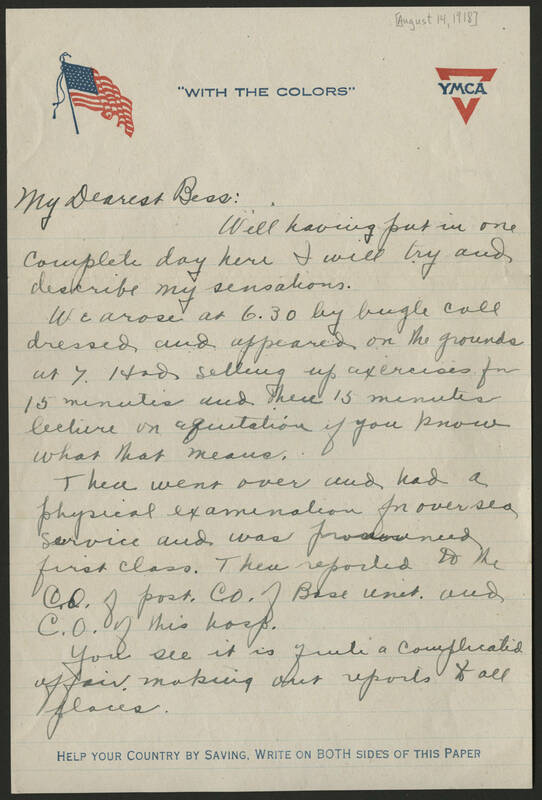 of post, Co. of Base unit and C.O. of this hosp. You see it is quite a complicated affair making out reports to all places.